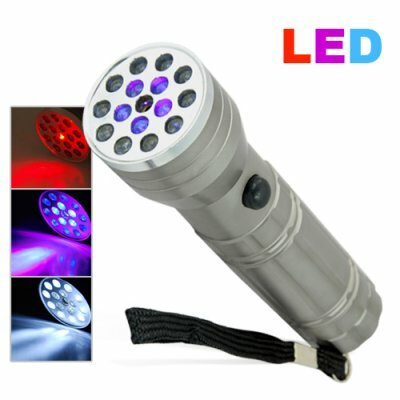 Successfully Added CSI 3-in-1 Super Flashlight (LED, UV, Laser) to your Shopping Cart. New three-in-one function super flashlight for illuminating just about anything you can imagine! So how does it work? One button press gives you the standard bright white light you need from a standard pocket sized LED torchlight. A second press gives you a red laser you can use for fun or work. The third press gives you a UV light you can use to find hidden holograms or to do a CSI type inspection of the other interesting materials in your present location. Whether you just want to impress friends with the latest "LED Gadget" or you are a true outdoorsman and need a hunting/exploring torch light, the CVJW-G76 Super Flashlight has got you covered. In stock right now for two piece or bulk stock orders, get yours today! Weatherproof - use it outside in any weather (but do not submerse under water). We recommend the use of rechargeable batteries to power this unit. Is this only a boy toy? No, girls can have fun with this product as well. You need a way to prove that kiss on your boyfriends collar wasn't from Aunt Betty? Now you can see if he finally catch him after the fact, even if he tried to wash out the evidence!